A trio of classic albums from The Whispers – with bonus tracks too! On the first set, the mighty group does way more here than just Whisper in your ear – as they're completely on top of their game, ending the 70s with a wickedly sharp sound that would help them stand strong for years to come! The group started in fragile harmony soul modes, grew with confidence in the 70s, hit a bit of a dancefloor mode – and here step off with this mature style that's totally wonderful – the best of all worlds together as one – shaped by arrangements from Tom Tom 84, Gene Page, and Keni Burke! Titles include "Whisper In Your Ear", "Homemade Lovin'", "If I Don't Get Your Love", "Love At Its Best", "Can't Do Without Love", and "Pretty Lady". 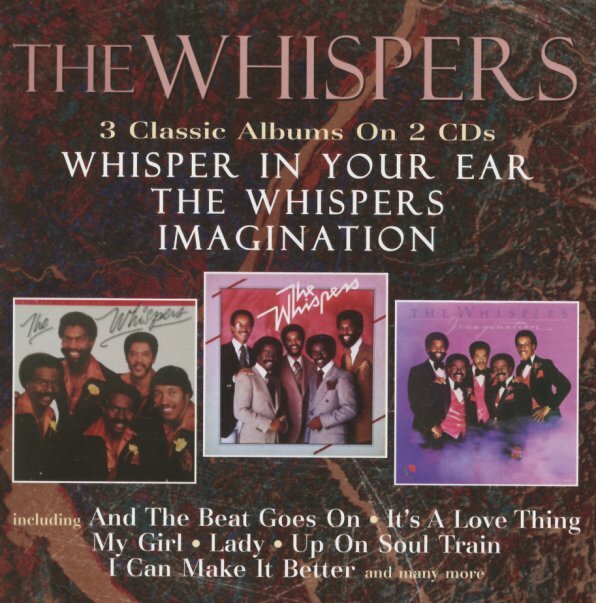 The 1979 Whispers album was one of a few to bear the group's name as its title – and it's also one of our favorite albums by The Whispers – a later gem with some really great songs, and a sound that shows the group strongly moving into hit territory! In some way, the album's almost a return to the mellow harmony soul of the group's roots – slowing down the pace from the disco years to craft some extremely great ballads and midtempo numbers. There's still a bunch of great club tracks too – like the classic "And The Beat Goes On" – but in a way, our favorite tracks are the mellower ones, like "Lady", "I Love You", and the sublime, "A Song For Donny", a tribute to the late Donny Hathaway, written around the music of his classic "This Christmas". On Imagination, the group takes off from the Philly groove style of their late 70s work, moving into a style that picks up all the best touches of the early 80s LA sound – electro keyboards, but not too much; quiet storm production, but not so much so that the album's smothered in it; and a professional approach to harmonies and songwriting that showed that the group was still an unstoppable force in soul music! Includes "Imagination", "It's A Love Thing", "Say You", "I Can Make It Better" and "Up On Soul Train". Bonus tracks include an instrumental of "Song For Donny" – plus 7" mixes of "Can't Do Without Love", "Can You Do The Boogie", "And The Beat Goes On", "It's A Love Thing", and "I Can Make It Better". © 1996-2019, Dusty Groove, Inc.